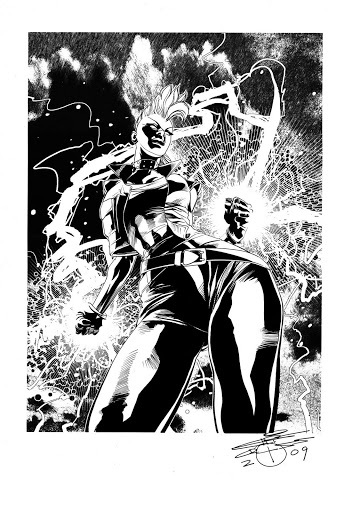 During late January, i was asked to do a Storm piece(as you can see above) for an art show for old Marvel charactere, specifically characters of color. 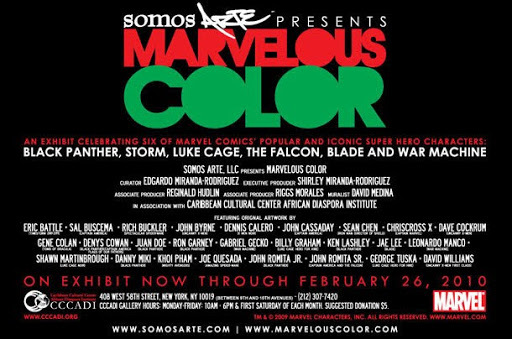 I had a night to do it, like any other deadline… and i got it to Edgardo Miranda, the man in charge of the MARVELOUS COLOR exhibit in upper Manhattan at the Carribean Arts center otherwise known as SOMOS ARTE. and there were a ton of people there, including Joe Quesada, who is Editor-in-chief of Marvel..
Shawn Martinbrough, who did his latest LUKE CAGE:NOIR…. and the man called Dennis Calero, just to name a few…. There was a video done that opened the forum as to how myself and Eric and others donated pieces for the exhibit. The exhibit closes on February 26th, so be sure to go and check it out!!! AND as usual, all links are embedded in the highlighted names in lavender. So click to give detail to your dreams. Dude. Well, well, WELL!!! It seems that all the pain of working on DANCE hasn’t gone unnoticed!! I got an email on facebook from Bill Williams, the writer of the SPIKE miniseries i’m doing for IDW presently… that i was on a list of artists that were nominated for a GLYPH award. Now… anytime i’m nominated for ANYTHING good, i’m glad just to be noticed. IF I WIN, that’s even better. It’ll be the first such award that i’ve ever won during my tenure as a comic illustrator. So i’ll take what i can get. But my boy Shawn Martinbrough is on the list, so if he gets it, i’ll be happy for him also. In the meantime, you can see it here when you click on the lavender GLYPH…. I’ll be posting a ton more stuff here to be perused.